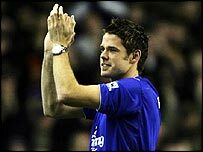 Everton have completed the £6m signing of Southampton striker James Beattie. The 26-year-old, who rejected a move to Aston Villa, became Everton's record signing in a four-and-a-half-year deal after passing a medical on Tuesday. Beattie is set to make his debut at Plymouth in Saturday's FA Cup third- round tie, which is live on BBC One. The England international scored 76 goals in 233 appearances for Saints after joining in 1998 from Blackburn, who will get a percentage of the fee. Beattie said Everton's ambition made it an easy decision for him. He told the club's official website: "I'm absolutely delighted with the move. "The chairman and the manager said how much they wanted me and wanted me to be a part of an Everton team that is doing really well. "I was impressed by what they had to say. Obviously the position that we are in at the minute, has made the decision very easy." Everton manager David Moyes said he was thrilled to have signed a player he believes is one of the top strikers in the Premiership. Moyes said: "We have kept up to date with his developments, and we are really pleased he felt Everton was the right choice for him. "His record stands up with all the strikers in the Premiership. "He will be a good centre forward for us here and his goals will hopefully be important," said the Toffees boss. By capturing Beattie, Everton have finally seen off Villa in a two-horse race that began in August. The Toffees were looking for a striker after selling Wayne Rooney to Manchester United, while Villa boss David O'Leary had earmarked Beattie as the man to lead his attack. But Southampton were determined to keep the big forward and, after rejecting offers from both clubs, they reported Villa to the Premier League in November for allegedly making an illegal approach. With new boss Harry Redknapp looking to reshape his squad, Saints finally accepted £6m bids from both clubs last week, leaving it to the player to choose between them. That he opted for Everton represents a coup for Moyes, who has turned a side battling against relegation into contenders for a European place. Tipped for the drop after Rooney's departure, Moyes' men have enjoyed a superb first half of the season, using team spirit and workrate to compensate for the lack of big-name players. The manager is confident Beattie's arrival will not disrupt that. "I've spoken to several people about James and they have all given a very high recommendation," Moyes said. "We have a lot of good characters here and we want the players we sign to mould into a good, honest team ethic." Moyes is also hopeful Beattie won't be the only new face at Goodison in January. He said: "I am hoping to bring a couple more in if possible. "We are short of numbers and some of the lads could do with a bit of a rest, so I hope this is not the only new arrival."